We found seven modern dwellings that are perfectly suited for tranquil living in the woods. For an aging couple in Oregon, living in a single-level home was becoming more and more important, as was the idea of creating a lifelong, “family camp” dwelling. 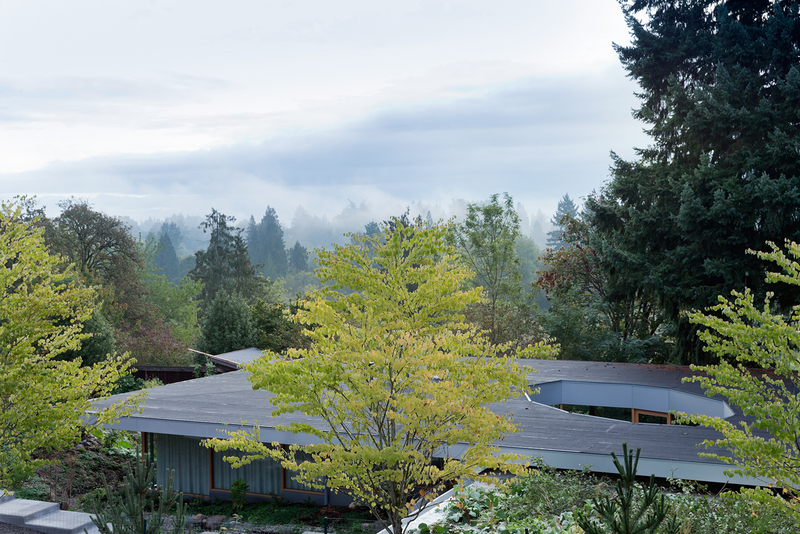 The couple’s son, architect Andrew Heid, built this gorgeous abode amidst the trees on a parcel of land in the Willamette Valley, near the historic town of Aurora. “Because you have this incredible proximity and connection to the outside, you have a higher aesthetic awareness,” says Heid. Oregon is also the perfect nesting spot for younger couples looking to commune with nature. Such is the case with this modern Portland home, which sits near the bustling downtown area, just up a forested ridge. In a corner of the living area, a Corbusier chaise and Eileen Gray end table create a cozy lounging corner. French designer Philippe Starck worked with Slovenian prefab builder Riko to create an ecologically minded prototype called P.A.T.H. The first of its kind is built at a wooded test site in Montfort l’Amaury, near Paris. San Francisco transplants settled down in the serene forested area of Raleigh, North Carolina for lower-cost living outside of the city. Beech, dogwood, and chestnut treetops can be seen from nearly every room in the house, including the living room. Floor-to-ceiling glass windows display the beauty that sits just outside this modern home in Aarhus, Denmark, while wood floors bring natural textures in to the dining room. "The objective was to create a house that brings the forest inside through large glass panels—and create an ever-changing seasonal backdrop for the interior living spaces," the architecture firm, C.F. Møller, says of the 3,200-square-foot abode. While Claire and Ken Stevens had lived in this Tacoma, Washington house since the early 1970s, Ken’s Alzheimer’s diagnosis forced the retired couple to re-think their home’s multi-level layout. For the modern update, architect Ko Wibowo created an open, accessible space that’s compatible with the original structure, works well with the surrounding topography, and promotes a sense of familiarity for Ken.